Polly loves her life. Her small but cozy bedroom, the nutty schemes of her best friends, the Protheroes who live downstairs — it all seems so right that Polly hardly notices that she’s never known her father. But when the house is suddenly sold, and it becomes obvious that her mother isn’t very good at finding a new home they can afford, Polly begins to doubt that her life was so perfect after all. I started this story in response to a radio interview I heard with a woman who had been homeless. As I developed the story I realized why the prospect of homelessness is so frightening to me. If home is where you can truly be yourself, then if you had nowhere to life perhaps you wouldn’t know who you were. That’s what happens to Polly in Pick-Up Sticks. She has to figure out who she is. Ellis’s writing is lean and child-centered; her insights are perceptive and have an unmistakable ring of honesty. Ellis deftly presents believable characters and situations, and shows how the spirit of family can be captured in non-traditional relationships. Ordinary people, simple events, big themes. A lovely book. 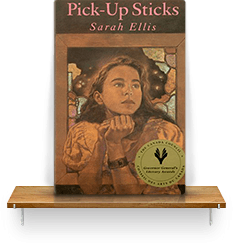 Pick-Up Sticks won the Governor-General’s Award for Children’s Literature and was on the School Library Journal’s list of Best Books of the Year. It has been translated into French and Danish.